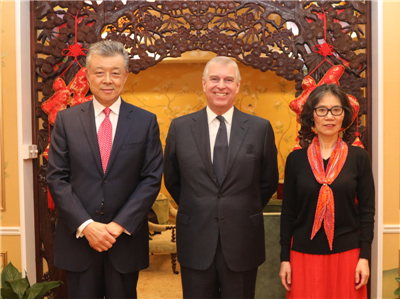 On February 13, the ninth day of the first month of the Chinese lunar calendar, Ambassador Liu Xiaoming and Madam Hu Pinghua hosted HRH The Duke of York at their residence to celebrate the Spring Festival of the Year of Pig. Ambassador Liu mentioned the recent festive atmosphere of the Chinese New Year across the UK from Downing Street to the Parliament, from political parties to businesses, from universities to communities, and from London to Manchester, Edinburgh, and Cardiff. The Chinese New Year is increasingly becoming a festival for both the Chinese and British people. Last year, HRH The Duke of York visited China twice, which enhanced China-UK cooperation on investment and scientific and technological innovation and made the Pitch@Palace a new platform for China-UK cooperation on innovation and entrepreneurship. The Ambassador expressed his hope that His Royal Highness and the British Royal Family will make new contribution to enhancing the friendship between the two peoples and the development of China-UK relations in the new year. The Duke extended the New Year greetings to the Chinese people, saying that it was a great honour that he was received by President Xi Jinping during his visit to China last year and led the British delegation to attend the first China International Import Expo. He hoped that the Pitch@Palace China would be more successful to contribute to China-UK technology innovation cooperation. 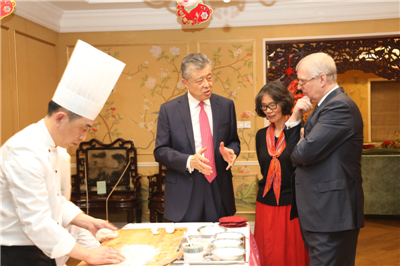 The Duke watched the chef making Chinese steamed vegetable buns and glutinous rice balls with Ambassador Liu and Madam Hu. Amanda Thirsk, the Duke’s Private Secretary and Director of Pitch@Palace, Minister Zhu Qin and Minister Chen Wen of the Chinese Embassy in the UK were present.